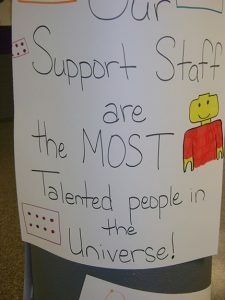 JW Wiseman Elementary School – The Support Staff at our school is one of the most important aspects of JW Wiseman. Like Legos, they are “the most important people in the universe”. They are such wonderful ladies, they even made their own Thank You poster and posted it in the school to say how much they appreciated their special day. Click here for the photos.